This quilt I made for my son for his 26th BD in August. It's from a National Park quilt pattern. "Pineland Patches" Barb had her version of the quilt hanging in her diningroom. I thought I'd like to try it. I got my stash out and with Barb's help(she had saved the instructions but they weren't the easiest the understand ) I got it done to give him. I don't think you can see it in the picture, but the picture fabric,( the mountains, deer & the ducks) I hand quilted around each individual tree & mountain, deer & duck. 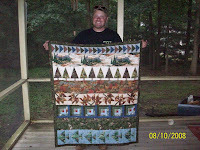 He's a duck & deer hunter & likes to fish so I thought it was a perfect pattern for him. As you can see, he was all smiles :) He's a great son ! The Other Barb did this quilt proud! It's amazing how different a quilt can look when made with different fabrics. Stash's are never all the same! VERY nice, Barb!!! This is perfect for someone with the kind of interests your son has!